I have been taking a Whole Foods Plant Based cooking class. One of the lessons involved blanching broccoli. This is how I used the head of broccoli that I blanched. 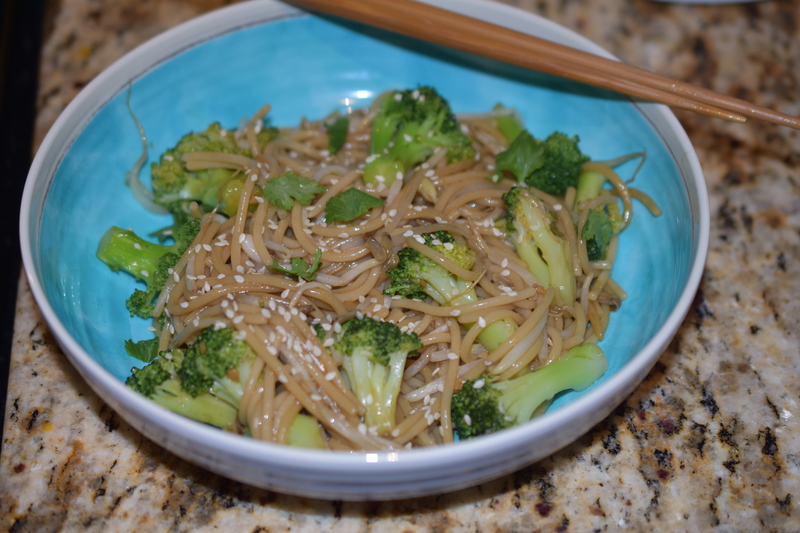 By combining the broccoli with some noodles and my Chinese Brown Sauce I have a quick and satisfying meal. Prepare spaghetti according to box directions. Drain. Do not rinse. Set aside. Note: You can blanch the broccoli with the spaghetti. Just add the broccoli florets the last 60 seconds. I have done this method before and it works if you are using the broccoli right away. Just remember the broccoli will continue to cook if you do not put it into an ice bath. I like to use my pancake griddle to stir-fry my noodles and veggies. It gives you a large surface, which lends to even cooking. Spread noodles and broccoli evenly over a preheated griddle pan (350 degrees). Cook for a couple of minutes. Turn noodles and broccoli over, just like you would do with hamburgers. Add Chinese Brown Sauce and sprouts to noodles and broccoli. Stir, and let cook for about 2 minutes. Very tasty too. Thanks for stopping by.